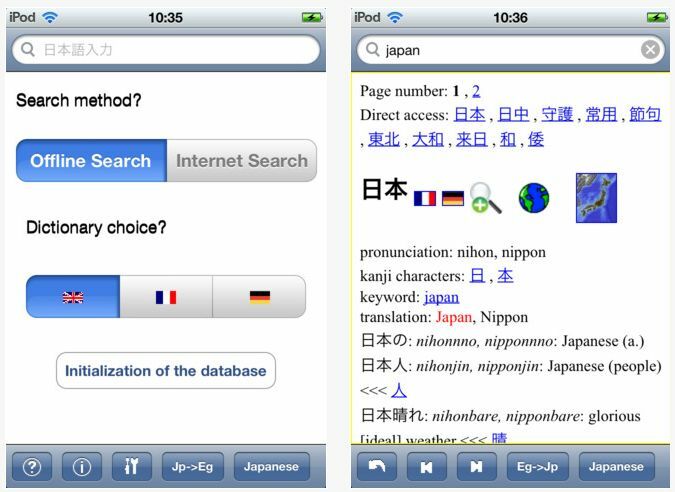 Euro-Japan Dictionary, developed by Free Light Software, is an excellent Japanese dictionary which supports 3 major European languages: English, French and German. The best part about this app is that it has 2 different search methods. Offline search and Internet search. Having the offline search feature is perfect for traveling when you are in an area with no cell service you can still use the application. The offline method downloads the database directly to your iPhone so you will want to make sure that you initialize the database right away so your not stuck anywhere without a connection. Supported input methods for Japanese are Kanji (Chinese characters), Kana (Japanese phonetic characters) and Romaji (Roman characters). You also have the choice of which server you want to use, the choices are docoja.com or webdico.com. Since I am going to be traveling to Germany, I thought I would give this app a try. It is excellent! I have already used it to chat with some German friends and they were amazed how fast I could look up a word, see the meaning, and get the pronunciation correct. Overall this application is very simple to use and provides you with a ton of information right at your finger tips. Since the newer iPhones have voice imput directly, you can quickly just say a word and not have to worry about spelling. If you are traveling to a place that speaks English, Japanese, German, or French, this is the application you will want to try out. It is currently just $0.99 on the Apple App Store and is worth checking out at that price. The offline feature alone is well worth the price.